As the title implies, this self-study course is for students going to an English-speaking country or on an Erasmus experience, where English is the language used at the university. For a language teacher, this resource could be useful in presenting research skills. The first chapter, as well as synthesizing the keys for success at the university, addresses key questions for the reader who is concerned by having to delve into countless hours of it using English. Whether the book is slated for undergraduate or graduate work is not entirely clear, yet it is important to keep in mind that this is designed for self-study rather than a course book and thus lays out research as a process than staging it for classroom settings. To lend itself to varied backgrounds and skills in research, self-contained chapters allow more experienced researchers to skip several areas, such as “Accessing the right information” and “Choosing the right source material,” and rely on a few of the more difficult one like “Finding your own voice” or “Writing up”. Each of the 13 chapters provides approximately five hours of individual reflection and study, with short exercises throughout, ranging from matching to focus questions. Actual tidbits of up-to-date and interesting sources are compiled from various sources to allow for reflection and analysis. Step by step this manual underlines the importance of pre-writing as well as the footwork involved before putting pen to paper, starting with the essential step of understanding the question and grasping the aim of the writing task. Then, presentation on narrowing focus and creating a refined research question follows. Once the research is to begin, naturally the issue of credibility of sources arises, which the book addresses successfully, especially for the undergraduate crowd, giving specific examples of academic language and the type of language that makes texts credible. Another type of interesting activity is working with bibliography entries, helping learners identify types of reference work and tips for finding these. Additionally, a small section on keyword searches is useful in training students to find information using databases and catalogues. For undergraduate students in particular, emphasis is placed on evaluating and choosing resources, so as to lead them through the process of weighing accessibility of content, on one hand, compared to the scientific and innovative aspects of the work, on the other. Reading skills are then treated, which are helpful when approaching reading in a foreign language, namely strategies for skimming, scanning and intensive reading. Following that, extensive focus is placed on reading both efficiently and critically, as well as note-taking. Outlining appears next, an interesting chapter because it provides a basis for students coming from non-Western world argument styles and allows learners to follow the process of structuring the paper. Seen from a language teacher’s point of view, the last third constitutes an ample introduction to the writing process. It goes into the actual writing up of papers, which in itself is a large topic, so in this volume only the essential can be covered. Another volume, Writing, is part of this six-book series, and no doubt working from this introduction on to that volume dedicated to writing would make for an engaging academic success course. Using these two resources to provide the framework for the course could make for an effective course when supplementing the material given with specific subject-related material. The exercises are general so as to appeal to any field, and the approach is clear enough to incorporate personalized content for classroom use, lecturing following the exposition of skills in the book. This type of course is in demand now, as more and more universities outside of English-speaking countries begin to use English as the language of instruction. 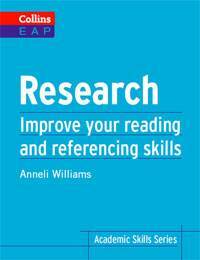 This book would meet that demand and serve as a handbook when preparing students for academic writing in English. All in all, in terms of the direct application of this manual, it may be difficult to implement as a course book at a language school. However, it could be used for one-to-one classes or for university research skills classes. Indeed, the book is open to several target groups who are going to study abroad, especially apt for undergraduates who need to learn how to write a term paper. Several chapters are worth teachers reviewing to see how to prepare students for university study abroad and so, in conjunction with the writing book, the volumes could form the backbone for an interesting skills course. For graduate students, the book could serve as a bridge between their highly developed research skills in the L1 and English-speaking academic culture which could be later supplemented by self-study books on writing dissertations. Finally, this book would serve as a good reference tool for the language teacher who needs to help students with research in English and, with some elaboration, could potentially be used for a study skills short course.